U.S. President Donald Trump speaks as Secretary of Education Betsy DeVos listens during a parent-teacher conference at the Roosevelt Room of the White House February 14, 2017 in Washington, DC. The White House held the session to discuss education. Utter the words “Sallie Mae” around anyone over the age of 18, and there’s an 87% likelihood they’ll either break out in hives or convulse on the floor with a seizure. But for many of us who opt to pursue higher education, student loans are a costly—if not necessary—evil. 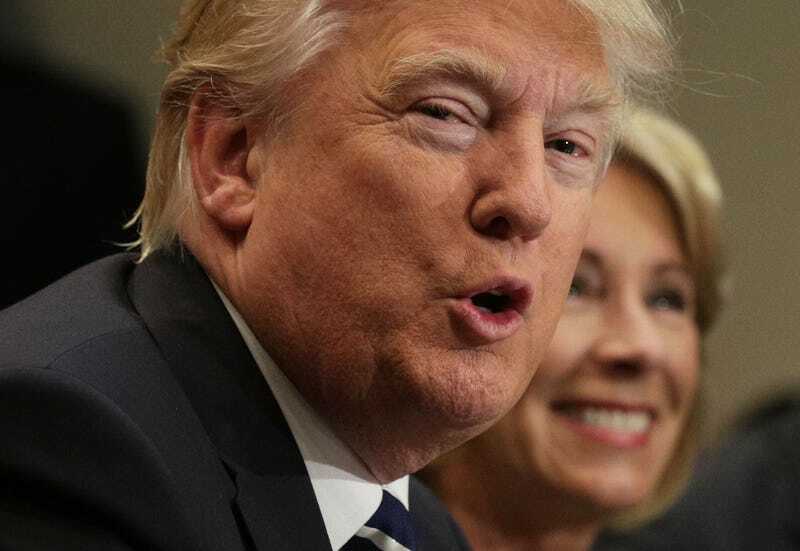 As such, our alleged president Donald Trump and his pet sycophant Education Secretary Betsy Devos—also known as the Axis of Ineptitude—urged Congress on Monday to pump the brakes on the amount of money that students and families can borrow. In theory, that has the potential to reduce exorbitant tuition rates, but in actuality punishes working-class families—limiting their ability to compete against the Felicity Huffmans and Lori Loughlins of the world. “The fact that we have a two-track system for graduate and undergraduate education shows that we treat higher education as a commodity, and the borrowers as consumers, and that’s not how we should treat them,” Student Debt Crisis executive director Natalia Abrams told ThinkProgress. “I think with this whole college bribery scandal, we’re seeing that colleges are brands in their own right. When people are paying an extra million dollars to send their kids to a college on top of the yearly costs,” she said, it’s evidence that the government should intervene. So while the Axis of Ineptitude is pretending to spare us the wrath of Sallie Mae—while keenly aware that the vast majority of us missed out on the million dollar trust fund lottery—they’re actually intensifying the academic gulf between the haves and the have nots. Because without student loans to balance the scales, guess whose wallets—and educations—will suffer the consequences? Middle-income families eager to keep up, however, would end up taking on much more costly private student loans to fill the gap created by the caps. Their inevitable struggles to make the often-usurious payments on such loans, will allow lawmakers to simply shrug and click their tongues about personal responsibility — especially since those new defaults won’t be hitting the government’s own balance sheet. So what would McCann propose in its place? Another solution—which would curtail the $1.5 trillion in student loans that 45 million Americans already owe, and instead allow that money to be funneled back into stimulating our broken economy—is student loan forgiveness. This option is already available for military veterans, teachers, and other groups who qualify, but expanding its scope could eradicate the class disparity in our education system. And nothing would signal the dawn of a new system like free college all together—a flag that a bevy of 2020 Democratic candidates have already planted in the sand. But as enticing as it sounds, doing so would require ingenuity in its implementation. While tax credits, grants, and national service programs were suggested as pieces of the puzzle in the past, there’s also questions about eligibility. And what exactly does “free” entail? “Progressive candidates need to be talking about debt-free college instead of just free college, and going beyond tuition for low-income students,” Tiffany Jones, the director of higher-education policy at the Education Trust, told The Atlantic. But the fact remains that in order to quell academic inequity, an ill-conceived cap on student loans ain’t it. Employers May Soon Help With Student Loan Debt—but Will Black Grads Be Left Behind?